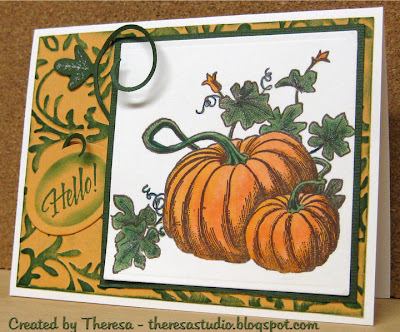 Theresa's Studio: Fall Is Coming? I have been "stalking" the lovely challenges and entries at Joan's Gardens and decided this week to join in. Her challenge this week is to do a fall theme card using pumpkins or fall leaves with either embossing or glitter. I dusted off an old pumpkin stamp that I love and was one of the first used stamps I bought but is one of my faves. I colored the image using Copics and added glitter to the leaves. I matted the image with a dark green CS. On top of the base card is an embossed mat that I sponged the raised edges. I added a cutout flourish that I tucked under the image and left loose on the card to mimic a vine. Finished with a sentiment stamped on an oval. Sometimes it is fun to use one of your old stamps ....the oldies but goodies! Thanks for stopping by. Great card, Theresa! Fall is my favorite time to stamp and color! Love your background - it's beautiful! Thought it was DP at first glance! Well done, dear friend! You have done an outstanding job!!! I love the bg, and that image is to die for! Great coloring!!! I love using my old stamps... Yours is beautiful, your coloring is magnificent! Gorgeous card! Loved the sponged embossing, it looks so effective! Hi Theresa! Good to see you here at ABS Embossing challenge. I saw your lovely card over at Joans - beautiful colouring and the sponged embossing is perfect. Love your image and it's so beautifully coloured, just stunning! Theresa, this card is gorgeous. I also love your pumpkin stamp. You did a great job coloring it too. The embossing really adds a lot! Thanks so very much for playing Joan's Gardens #8 Challenge. This is so much fun!